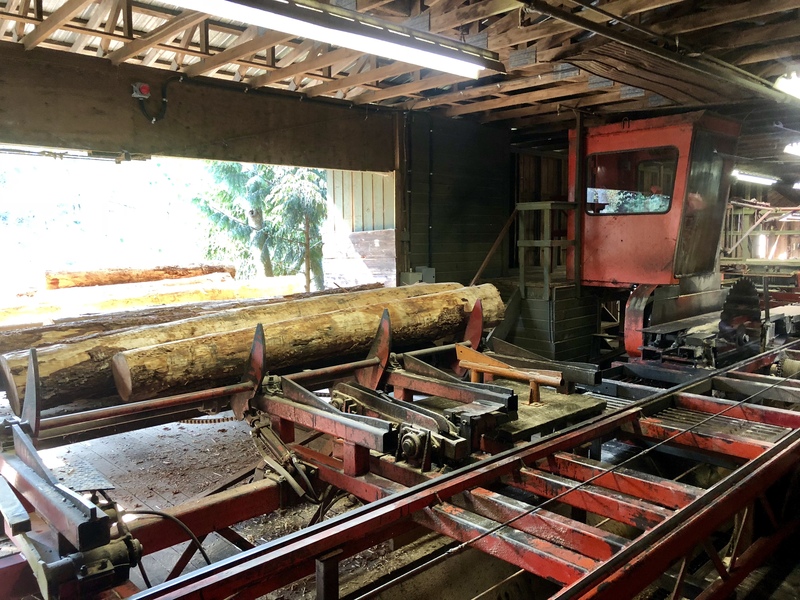 Products And Services – Thomson Bros. Lumber Co. Ltd. | A family sawmill since 1968. What we are known for best. 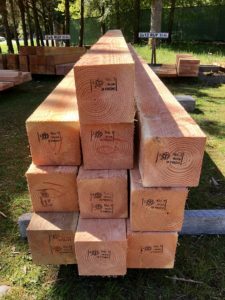 We carry Full dimension rough lumber traditionally circular sawn on-site with local retail sales open to the general public. 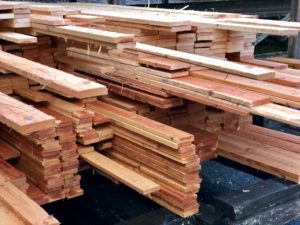 We normally stock to carry standard board sizes up to 14′, as well as creating custom sizes which can be made to order if log availability permits. Please stop by in person, call or leave a price quote request for pricing and availability of the wood product you are looking for. Common uses of our wood products include Fencing, Decking, Sheds, Pergolas, Post and Beam Timbers, Siding, Raised Garden Beds, Oversized Framing, Structural Blocking, Marine and Industrial applications, and much more! All lumber and timber products are milled from sustainable second-growth Douglas-Fir grown on Vancouver Island. We do not cut any Cedar products due to sub par wood quality and uses in equivalently aged second-growth Cedar compared to Douglas-Fir, little local demand due to over inflated Coast timber prices, as well as environmental concerns due to byproducts created when milling. We also offer custom sawing of logs to customers specifications. 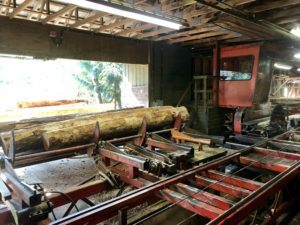 We have the milling equipment and expertise to process logs from 6″-18″ log diameter and a maximum length of 16′. 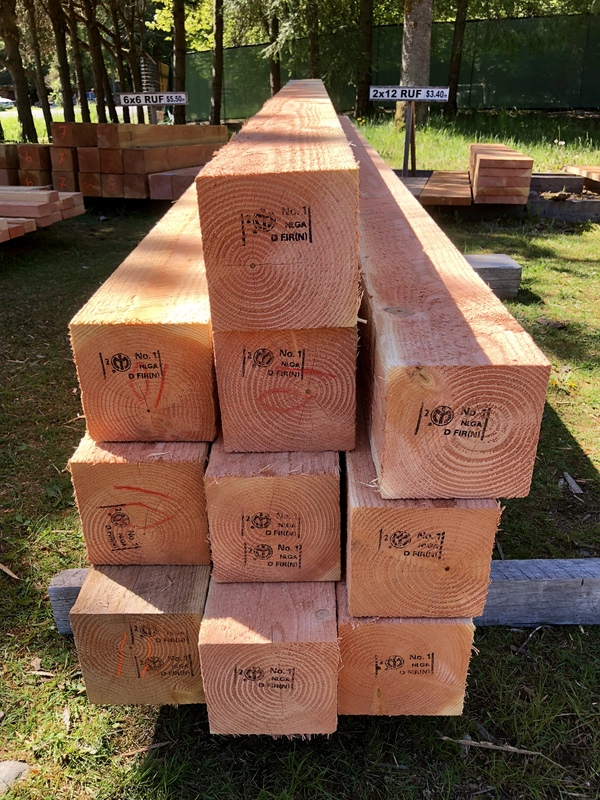 Logs can be processed to green sawn rough lumber all the way to finished surfaced 4 sized (S4S) planed based on customers requirements and needs. We buy short cut-to-length Fir logs. Log Diameter size from 6″-18″. Minimum log length required is 5’6″. Log lengths require minimum 4″ over standard length for trim. Contact the office today if you have short Fir logs to sell. We sell mill ends (slab wood, edgings, trim ends) cut to firewood on site from small loads to use camping to standard pick up truck loads. 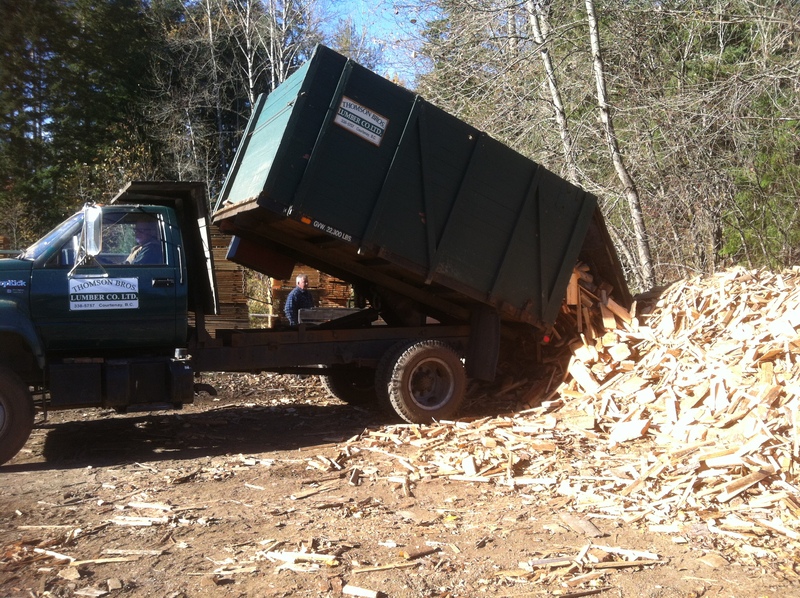 As well, we deliver 2 cord loads with our firewood truck locally within the Comox Valley. Please contact for more information. 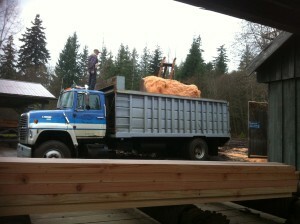 2 cord mill ends firewood truck delivered within 10km of sawmill $280 taxes in. 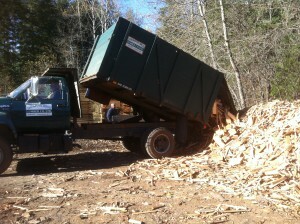 Loads are available year round based on log availability. Extra delivery charge for longer distances. Within Merville to Union Bay ONLY. On site firewood sales are not available at this time. Whether you need a bag or a dump truck full of sawdust or wood shavings, we collect all byproducts from our machinery we sell primarily for animal bedding, garden mulch, and other agricultural purposes. Please contact for pricing of the amount of material you need.